Remember when guys actually made things? Not just went out and bought a kit, but actually made things? 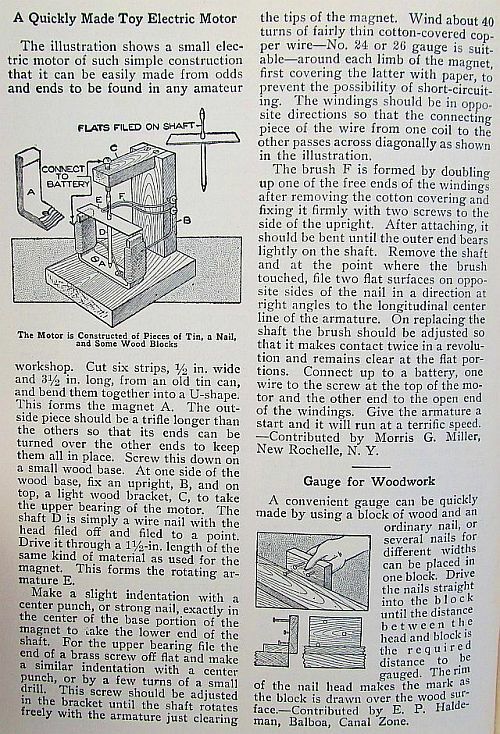 Back in the 30's, 40's & 50's popular Mechanics Magazine printed plans for scratch projects. I am now looking at the May 66 issue on building an aqua-car. 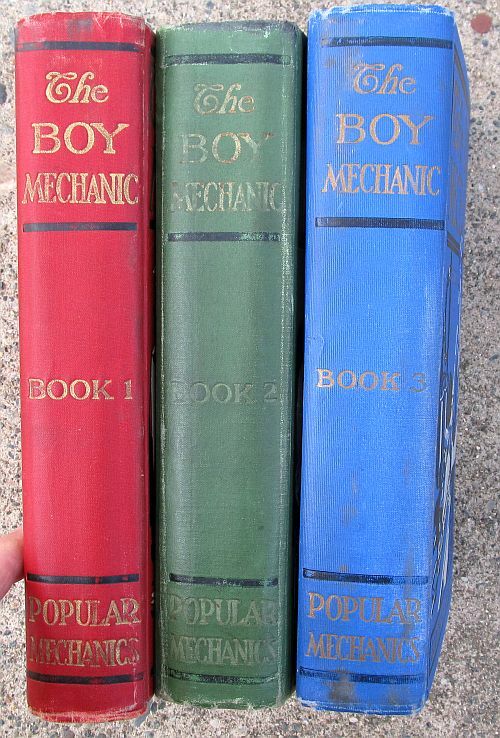 There was a series of books from about 1908 to 1925 or so called " The Boy Mechanic " , a total of 4 books in the series . WOW !! , if that series was for BOYS , the MEN then must have been incredible machinists and mechanics . If you ever get a chance to look in one of " The Boy Mechanic " series books , you WILL be impressed as to the skill level that was taken for granted with the projects presented for BOYS to build . I guess the thought was " If we challenge them , they will rise up to the level we set for them ." The level set was HIGH !! Those books were fantastic! I had several and made an electric scooter from plans in one. I found an old one in a bookstore and sent to my grandson. Thanks for that referance, I will enjoy looking at it (didn't know that was on the web! Bud Go to Google Books. I'd never heard of it till Doug mentioned it. Looks like some good reading. The original series of books have things like machining steam engines from scrap , making radio sets from scratch , printing , making telegraph sets , etc. etc. , !! ALL MODEL T ERA STUFF !! Find a reference to the original books , not the dumbed-down reprint of the safest simple projects for our litigious era of safety-at-all-costs , no liability issues , age . You WILL be rewarded for your efforts !! The last one , Vol. # 4 , is the hardest one to find , it took 15 pre-internet years for me to find it , combing antique stores , local swap meets , book stores , and car swap meets every weekend to get a copy . It was worth it though , as YOU will see when you find ANY copy of the four !! GOOD LUCK , and GOOD READING !! And a VERRRY MERRY CHRISTMAS TO ALL !! Anybody hear of the LeJay Manual? It gives a listing/description of projects to make using model T generators, starters, generator and starter field coils for making welders and a myriad of interesting projects. HELLO AGAIN , guys !! I just looked around on the internet a bit : The best deal I could find on the 1999 HARDBOUND reprint edition is at <leevalley.com> in Canada . This is a VERY high-quality reprint , on acid-free paper , linen-bound , full size . They have Vol. #`s 2 & 3 ONLY , on closeout @ $12.50 U.S.$ , plus $8.95 postage for both to the good `ole U.S.A. . Vol. # 1 & 4 , and the full set are sold out there , too bad ,`cause the full set of 4 was only $49.99 there !! Be careful ,`cause there are so-so paperback reprints , print-on-demand junk , and disguised "cd" copies out there too , as well as the original books . The original books tend to be well beat-up , `cause kids owned `em , and used `em , a LOT , but still expensive . And, they`re like our Model T `s , close to 100 years old . Too bad books cannot be made of cast iron , too !! GOOD LUCK to you all in your search !! John : Yup , I bought one from the Lejay Company back in the late `70`s , when LeJay was still in business . In fact , at the time I bought the manual , the only business LeJay still HAD was selling the manual , `cause the kits and parts were looong gone . I saw it in " The Whole Earth Catalog " , and ordered one . It was a bit of a disappointment : most of the projects were of limited usefulness `cause of low power , hard-to-get parts , or just plain obsolete . Like the Model T generator converted into a wind generator to charge your radio battery , Imagine !! Fun to read , though , and a illuminating insight into just how BAD things were in the Depression , that people would go to these lengths to improve their lot in life . FAR more time than money or possessions . The LeJay manual is still available for under $10.00 , as a current reprint , easily . Probably some originals out there , too , but it was always cheaply printed : it was used mostly as a come-on to sell the parts and kits that LeJay sold to complete the projects described in the manual . The really interesting ones for me are from the twenties - when it was assumed any one reading the articles would not have any trouble at all in making casting patterns and taking them down to the corner foundry to be cast. I think this series of books is a great way for father and son to share some quality time picking out neat projects and working on them together especially since industrial arts is becoming a by-gone thing in public school. Here's a photo of my set that I have read many times over the years. I have built several projects from these books starting with the toy electric motor when I was in sixth grade back in the 1950's. When I was a kid ('40's - '50's) my Dad not only subscribed to Popular Mechanics, he also bought, one at a time, the whole hard-bound series of Popular Mechanics, "How To Do It" books. Not sure if that's the correct name or not, as they have their own shelf in my shop, and I'm too lazy to go out and look. But anyway, they are a great set of books, as was the magazine back in those days. I really think PM started to go "downhill" when they changed the size and format, and I haven't the slightest idea when that was. I also liked Mechanics Illustrated; Dad and I used to read Tom McCahill's column before anything else. I sure miss Dad, Mechanics Illustrated and Popular Mechanics! ...And don`t forget Popular Science , that was another great magazine !! They did an article on building a replica Quadricycle , Henry`s first car . The replica was built exactly as the original one , even to the engine and transmission . All this talk on how good the books are has me wanting to find a set. Like I need anymore books tho- my library is around 3,000 volumes with a tad over third of that being books about Henry Ford & Ford Motor Co. History. Guess everyone has to collect something. Making electric motors was a childhood thing for me ... probably around age 10. Cut a small wood wheel out of plywood - maybe 2" diameter and put a nail thru it for an axle. Then cut a series of v shaped notches in a soup can lid and then form it around the wood wheel. Next wind an electromagent around a 3" nail. This was all mounted on a board and the wood wheel spun freely on two wood supports. The electromagnet was mounted near the edge of the wheel where the metallic strips left over from cutting out the V's were pressed a over the edge. The soup can lid acted as a switch along with another metallic finger contact. The axle was connected to one end of a battery and the other end was connected to a contact finger that pressed against the side of the wheel. When contact was made, the electromagnet pulled the wheel around and then contact was broken but inertia brought the next contact into position ... and so on and so on. I made a bunch of those over the years but probably none survived my insatiable desire to take stuff apart and make something else! I should check dad's shed some day - maybe one survived. I guess I quite making them about the time I received an electric motor kit for either Christmas or a birthday. The motor had to be wound with three poles as I remember. It's probably long gone too. Used to make my own flashlights with some wire, a couple of batteries and some metal strips for the contacts. Little good without a reflector tho, but it kept me out of trouble (well, almost). I could have been an evil Steve Urkel had I a set of those Boy Mechanic books ! I still make silly things today, although with substantially more finesse. ". . . especially since industrial arts is becoming a by-gone thing in public school. " That is so true. I have the very last BA in Industrial Arts given by CSU, Chico (originally Chico Normal School, established to provide teachers for the California school systems). That was 1990--and it was outdate when I got it, but they had to honor the catalog when I started (I was 37 at the time). Will never forget the great Gus Wilson and the Model Garage stories. Gus was my favorite and taught me a fair bit about auto mechanics! Anyone recall why Miss Daisy Allan's tires went flat.. or how Gus fixed the helicopter starter? One great thing about the "Gus" stories, is they are all available here . . . I've been re-reading the stories on the site that Art recommended and apparently Silas appeared in the first story about Gus in 1939. Don't know how long he lasted but there's alot of reading here. I remember Tom McCahill too. Have been using his tips for driving in snow for as long as I'm driving. David - Remember how ol' Tom went on, and on, and ON about how stupid he thought it was when Detroit stopped building cars with vent windows? Talk about somebody with something "stuck-in-their-craw"! He continued to bring that one up in his column for many years! Also, about 1958, dual headlights were all the thing, and he didn't think much of those either! His favorite line about that was that two good headlights were much better than four poor ones! Yeah, you're right David; ol' Tom didn't pull any punches! Oh, and one more; all men's shirts should be cotton, and ONLY cotton! He HATED shirts made of anything synthetic! Actually David, neither of us said it, but Tom McCahill's column was in Mechanics Illustrated, not Popular Mechanics, but no matter; I'm sure that most guys that read Popular Mechanics also read Mechanics Illustrated and Popular Science. Remember that for what seemed to be the longest time, Mechanics Illustrated always said on the cover, "Still only $.25 cents"
As he should have. My favorite Tom McCahill quote was that "It cornered like a gopher in a stovepipe." Right after that was that the new Edsel looked "like a Carp sucking on a lemon." John punch "lantern Jawed" into goggle for the answer to your wonder. Go to the "Popular Science" site Art Bell posted at 2:06 and go to the July 1963 issue, pages 68-72 and 174; and pages 73-75 and 176. You will find the two articles that began my lifelong infatuation with the Model T when I first read the two articles in this issue in the back seat of my parents car at the age of 9 on our way to visit my Grandparents. On the way there, I must have read the articles 4 times and by the time I got to my Grandparents, I had plenty of questions for Grandpa (b. 1897), which he was more than happy to answer, including the time one broke his arm. 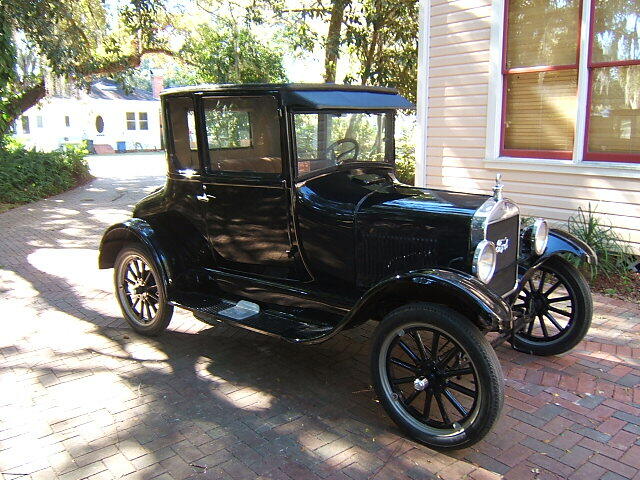 My dream from then on, was to own a Model T which was realized in 1970 when, at the age of 16, I bought my first one for $600.00. For the next 2 years, all my spare time and money was spent restoring that Model T and the first place I drove it was the 50 miles to Grandpa's to give him a ride in October 1972. Although he was very ill, he got out of bed and got dressed for the ride I had been promising him. He was thrilled as I cranked it from the front and it roared to life. This was our last ride as, one month later, in November of '72, I entered the Marines and he and died less than one year later, in August, 1973, from lung cancer. Ah hah, Miss Daisy Allen! You know I have a prop for a wind charger for a radio here.In decent shape.Maby I should look up the plans for a generator and make 1. I built a tube radio from a old magazine plan from the 40's.I didnt wind the coil quite right but it did play.Was alot of fun and built on a bakeing pan with cloth covered cord! Of course I was a OLD boy,I think about 34 when i did it. Everything in those books and magazines are Fun and Challenging to make , Interesting , and Satisfying to complete . BUT , it takes time and effort , and you have to think and use your brain . No instant gratification means no interest from today`s kids . They want it NOW . Sad .